Jesus is here, he isn’t hiding. Can you find Jesus? I have to find Jesus. Sometimes I feel like he is hiding. I know he isn’t. But it seems like he is. One of my favorite apps is the You Version Bible App. I use it almost daily. I like that I can choose different devotional plans. The guided devotionals help me stay focused. Recently, I was following one called The Hope of Christmas by Rick Warren. The focus verse of Day 5 is John 4:10. 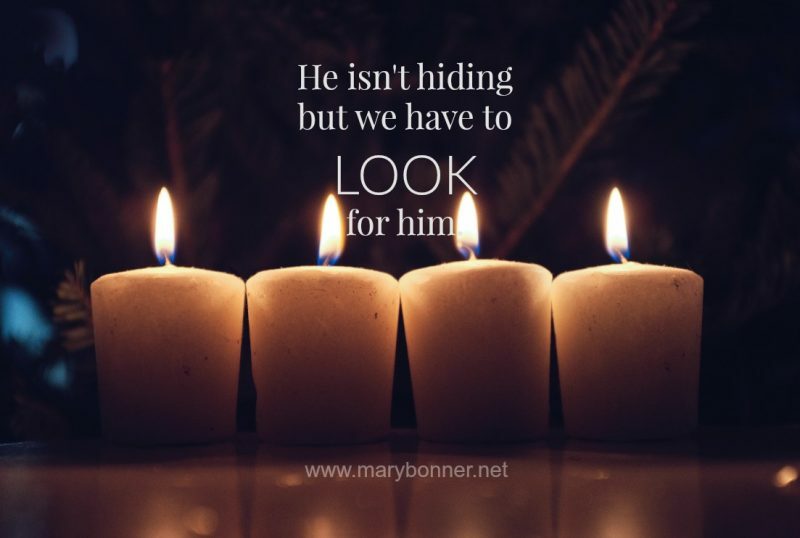 The devotional for the day reminded me that Jesus is all around…I have to look for him. I can miss him if I am not looking for him. I have to look for him. In the middle of my life. On the edge of my life. When I’m walking the dog or doing dishes. Grocery shopping, working or folding laundry. In all the unexpected places. Have you found him in an unexpected place? Read Rick Warren’s full devotional here.